Reeves DiVenere Wright practices Social Security/Disability law and is committed to helping people access important government benefits to help those who are unable to work because of disability. The Social Security and Supplemental Security Income disability programs are the largest of several Federal programs that provide assistance to people with disabilities. Social Security Disability Insurance pays benefits to you and possibly to certain members of your family if you are “insured,” meaning that you worked long enough and paid Social Security taxes. 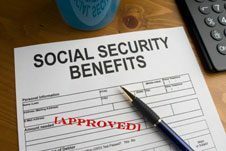 Supplemental Security Income pays benefits based on financial need. Do I need a Lawyer to get Supplemental Security Income or Social Security Disability Insurance? You do not have to have a lawyer to represent you in making a claim for Supplemental Security Income or Social Security Disability Insurance. In fact, you can apply for these benefits online at http://ssa.gov. You can also visit your local Social Security office or call 1-800-772-1213 (TTY 1-800-325-0778) between 7a.m. and 7p.m., Monday through Friday to make an appointment. Typically, people seeking these benefits get help from a lawyer after they have been denied. It is very important that the proper procedures are followed after a denial and many people find an attorney helpful in this process and in preparing evidence for your claim. Additionally, you may prefer to have a lawyer if you choose to go before an Administrative Law Judge. Reeves DiVenere Wright can help you at each stage of this process. Statistically, claimants who are represented by an attorney win a good deal more often than those who are not represented. Not even one day if you expect to be out of work for a year or more. You can file the same day you become sick. Waiting too long to file may cause you to miss out on available benefits. I have been denied benefits from the Social Security Administration. What are my options now? The majority of cases are denied at the initial level. Unless you have returned to work or will return to work very soon, you should appeal the decision by submitting a Request for Reconsideration. This Request for Reconsideration must be filed within 60 days of receiving your Notice of Disapproved Claims. Failure to appeal within the 60 day timeframe may mean that you have to restart the process from the beginning. Reeves DiVenere Wright can help you file your appeal. What happens after I appeal a Notice of Disapproved Claims? It depends. If you are approved, then that is the end of the process until your case is reviewed again by the Social Security Administration. If you are denied again after Reconsideration, you can request a hearing before an Administrative Law Judge. They use five-step question process. First, they ask if you are working. If you are working and your earnings average more than $1,000 a month, you generally cannot be considered disabled. If you are not working, they next ask if your condition is “severe.” Your condition must interfere with basic work-related activities for your claim to be considered. If it does not, the Social Security Administration will find that you are not disabled. If your condition does interfere with basic work-related activities, then the Administration looks to see if your condition is on their list of medical conditions that are so severe they automatically mean that you are disabled. If your condition is not on the list, they have to decide if it is of equal severity to a medical condition that is on the list. If it is, they will find that you are disabled. If it is not, they move to the Step 4. This step asks if your condition is severe enough to interfere with your ability to do the work you did previously. If it is not, your claim will be denied. If it is, they then ask if you can do any other type of work. If you cannot do the work you did in the past, they see if you are able to adjust to other work. They consider your medical conditions and your age, education, past work experience and any transferable skills you may have. If you cannot adjust to other work, your claim will be approved. If you can adjust to other work, your claim will be denied. Yes, the attorney-client privilege means that your communication with us confidential. This remains true even if you do not hire us. Does Reeves DiVenere Wright charge a consultation fee? No. All consultations dealing with Social Security/Disability are free. Call our office and our highly qualified staff will be pleased to schedule a time for you to come in.